If you’re planning a wedding, make it the social event of the season with some spectacular, crowd-pleasing entertainment. Here we explore some unique wedding entertainment ideas to get your guests fired up! There’s a brand new product on the market – Sparkular, a state of the art machine that omits a large plume of brightly coloured sparksat any height, duration or desired time, perfect for bridal entrances, first dances and cake cuttings. Once the bride has reached the groom at the aisle, why not also use water projection screens (an effect created using fine jets of falling water) as a breath-taking backdrop to frame the happy couple? A magician has the power to wow guests of all ages. If you’re looking for unique wedding entertainment ideas that will have everyone enthralled, you can rely on a magician to keep everyone under their spell. For extra excitement, use lighting effects or indoor pyrotechnics to add to the enchanting atmosphere. Music is essential to create the right mood for the start of your marriage. For unique musical entertainment, think outside the box: singing waiters have the novelty value that will get everyone smiling, while live harp music will provide an atmosphere of elegance and refinement. Alternatively, why not go for a silent disco, which is sure to get everyone up on their feet. Looking for impressive outdoor entertainment ideas for your big day? 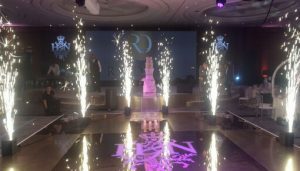 Illuminated wedding fountains are a stunning way to welcome your guests to the venue, and after dark they’ll make a truly impressive spectacle, accompanied by music and lights. Doubling up as both a form of entertainment and a decorative effect, your wedding fountains will look fantastic in photos and videos. 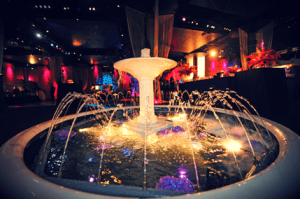 You could also choose an indoor fountain to add grace and grandeur to your venue. If you’re planning a summer wedding, make the most of your venue’s outdoor space. So much more than a picturesque area for photographs, you can use an outdoor expanse as a children’s playground or mini-festival. Provide games such as giant Jenga or install a bouncy castle. Throwing confetti is about as traditional as you can get at a wedding. For nuptials with a unique twist, go one step further and hire a confetti blaster to announce your arrival as a newly married couple. 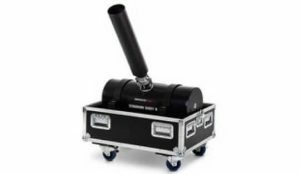 If you’re hosting an evening of wedding entertainment for a big crowd, you can use this large-scale confetti machine to welcome you to the stage – or to finish off with a fantastic finale. A firework display is an ordinary (if spectacular) way to celebrate, but at Entertainment Effects, we can make it extraordinary. Your display can be specifically designed for the occasion and choreographed to co-ordinate with the music of your choice. We’re old hands at wedding fireworks, so you can guarantee we’ll put on a show-stopping and unique wedding entertainment spectacle that will wow your guests and make it a day to remember.